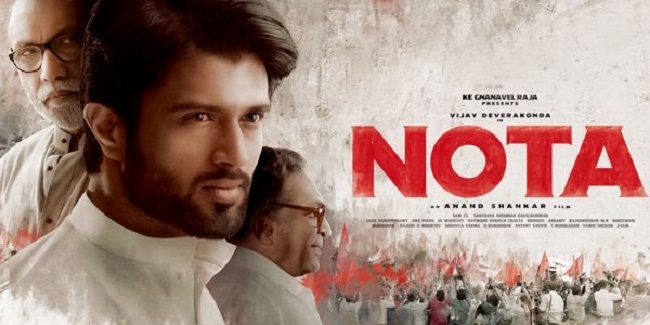 NOTA Synopsis: Sitting chief minister Vinodhan (Nasser), who is facing imprisonment in an illegal assets case, makes his son, Varun (Vijay Deverakonda) the temporary CM until his return. The disinterested young man gradually wakes up to the sorry state of affairs and tries to bring in a change. NOTA Review: The initial set-up of NOTA is pretty similar to the one in Bharat Ane Nenu, where the reluctant son of a chief minister has to take over the mantle from his father. Even their family set-up is similar. He is the son of the first wife, who is no more, and resides in London. There is a step-mother and a very young sibling. But there the comparison ends. For, Varun isn't an idealist like Bharat. The first time we see him, he is partying like there's no tomorrow. When he is told that he should take over as the chief minister, he remarks he doesn't even know who the governor is. When the governor asks him about the portfolios of his ministers, he is clueless. And he needs someone else to dress him up in dhoti, that trademark costume of a politician. More than the prospect of running the state, what worries him more are the flex boards that have been put up by his party men. One has his shaking hands with Donald Trump, and another sees him dressed up as Baahubali. And he is bothered about his friends turning these into memes on Facebook! The plot is all about how this happy-go-lucky youngster realises his responsibilties and acts for the welfare of the people. But NOTA doesn't flesh out this transformation in a gradual way, giving us scenes that show the evolution of this character. All we get is one scene - a tragedy that is staged in a perfunctory manner - to show us that Varun is someone who cares for others. We do get a hint of this earlier, when we are told that he takes care of a few orphan children, but what really makes us buy into Varun's new-found maturity is Vijay Deverakonda's assured performance. The film marks his Tamil debut, but the actor does a competent job; there is very little of the slang that we find in actors from other states, though his modulation needs a little work. The political scenes, some of which recall Mudhalvan, are the film’s strengths; in fact, its only strengths. For, the emotional drama between the characters is quite weak. The chief reason for this is that the characters, including Varun, are underwritten. Anand Shankar keeps giving us promising leads - a chief minister who is referred to as Rowdy CM, a political opponent (Sanchana Natrajan, impressive) who is equally young and more scheming, a counselor (Sathyaraj, in a Cho-like character) who could have a more personal interest in Varun - but he doesn't follow them through. Surprisingly, the film holds on to a revelation about the relationship between this counselor and Vinodhan until the climax, when we easily guess it right in the scene when it is first brought in. Instead, the director devotes more time on a hawala angle that is hardly dramatic. The lack of a strong antagonist, too, results in a political drama that is less punchy than it should have been. If NOTA works to the extent it does, it is because it unfolds like the highlights reel of the absurd political happenings that Tamil Nadu has been witnessing over the past two to three years. Anand Shankar gives us a steady stream of references to contemporary political events - a chief minister (his party functionaries bow so low before him that he worries that they would get his face wrong when they install his statue!) facing trial installing a proxy to safeguard his position, the flex board culture, the propaganda that parties do with their respective channels, the Chennai floods and the sticker controversy, the hospital drama, the resort farce, a godman trying to remote control the government, and so on. These moments deservingly get the cheers, for, in them, we see an outlet to show our frustrations. We are supposed to be satisfied with these digs at contemporary politics. While that is certainly a low bar to clear, given these turbulent times, it feels OK to buy into the fantasy of someone coming along and leading us towards a better future.